Download the PDF version of the infographic by clicking here. Many home owners and clients you already work with have are already been investing, leasing, developing real estate in one way or another. Bring up the topic to them and ask what they are currently doing and offer your assistance to see if you can help them do more. Most people are involved one way or another in both sides of the real estate world, whether it be leasing a commercial space for their business, investing in their own real estate portfolio, or developing a home to sell or live in. If you are sending out mass e-mails, making phone calls, door knocking or simply engaging people at cocktail parties, add in that you can help real estate clients with their commercial real estate needs. 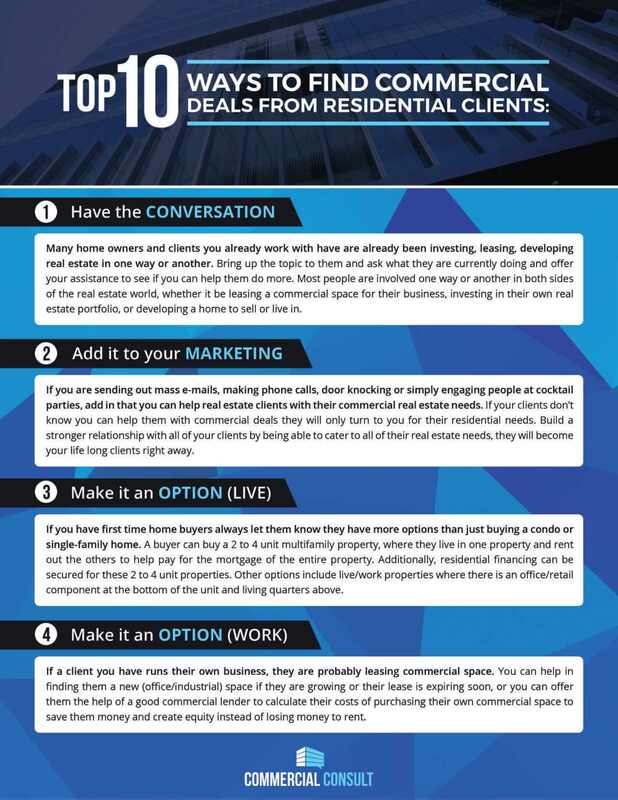 If your clients don't know you can help them with commercial deals they will only turn to you for their residential needs. Build a stronger relationship with all of your clients by being able to cater to all of their real estate needs, they will become your life long clients right away. If you have first time home buyers always let them know they have more options than just buying a condo or single-family home. A buyer can buy a 2 to 4 unit multifamily property, where they live in one property and rent out the others to help pay for the mortgage of the entire property. Additionally, residential financing can be secured for these 2 to 4 unit properties. Other options include live/work properties where there is an office/retail component at the bottom of the unit and living quarters above. If a client you have runs their own business, they are probably leasing commercial space. You can help in finding them a new (office/industrial) space if they are growing or their lease is expiring soon, or you can offer them the help of a good commercial lender to calculate their costs of purchasing their own commercial space to save them money and create equity instead of losing money to rent. Consistently networking with investors in your community is always helpful in growing your business, residential or commercial. But, beware, not all investors are on the same level. If an investor can be very specific in the types of investing they are currently doing, then that is always preferable to an investor that simple states they are "looking for a deal". Investors with clarity will not waste your time, if they see something they like they will know and will be able to act on it properly, as opposed to "deal" buyers who will probably not even act if you do show them a great deal. Converting the trust you have with one of your residential clients into a completely new field can be difficult, sometimes you will have to prove yourself first - connecting them with the right Commercial Broker partner will help ease the transition quite a bit. You can also provide resources in whatever the client may need from commercial lending, 1031 specialist, property management etc. to show you are capable in this market as well. Learn more about what your clients are doing and make it your mission to educate yourself on the subjects or team up with an agent that already is knowledgeable and experienced to help you learn by doing. There are plenty of great commercial courses available as well offered by your own brokerage or nationally, like CCIM. Always be meeting new people in the industry. From investors to commercial brokers to commercial lenders to developers increase your network and exposure to this side of the industry and increase your potential for making deals happen. Connecting people and properties is what real estate is all about, grow your network and guaranteed your income will grow with it. Once you identify a need from one of your clients find a partner that is knowledgeable in the asset class needed to work with through the entire process. 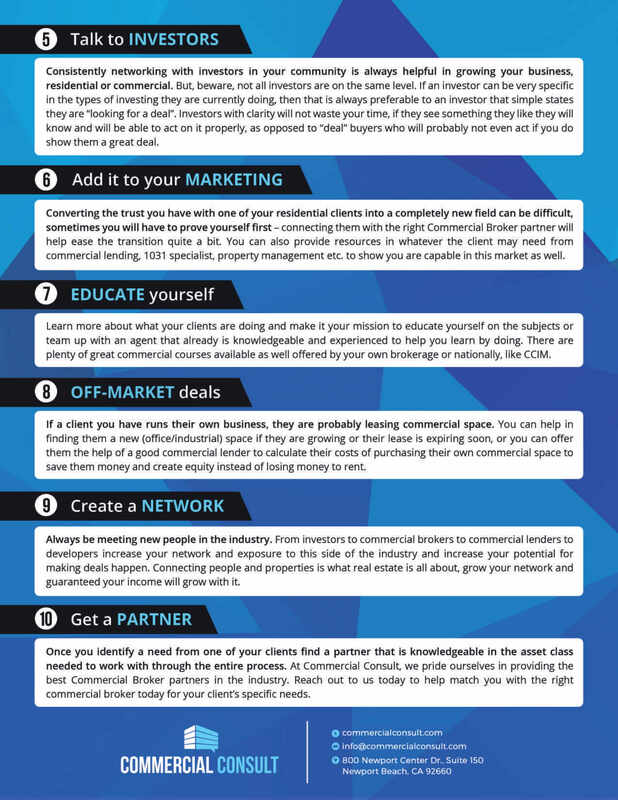 At Commercial Consult, we pride ourselves in providing the best Commercial Broker partners in the industry. Reach out to us today to help match you with the right commercial broker today for your client's specific needs.